1382 – UNITED STEEL COMPANIES Ltd., Colsterworth Quarries & Easton Mines. The Yorkshire Engine Company was bought by United Steel Companies to build the range of locomotives required by the growing and varied interests in which it was involved. 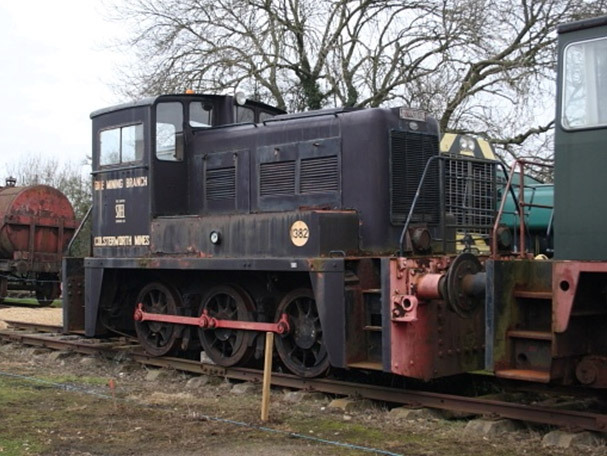 1382 was delivered to Colsterworth by rail with identical “sister” 1381 (Works No. 2871) as the Colsterworth system was dieselised in the early 1960’s. Colsterworth Quarries included a North and East range of pits and duties also included shunting the Easton Mines outpost, this being a drift mine on a site now occupied by the High Dyke frozen food complex. After the large system closed during 1972 & 1973, the locomotive was taken into the fleet at Normanby Park, Scunthorpe. The locomotive was secured for preservation, in full working order, arriving at Cottesmore on 28th May 1981. The locomotive was always a popular performer and we look forward to an early operational return for this very interesting loco.